Keep your rifle shooting at peak performance with the Voodoo Tactical Long Gun Cleaning Kit. Designed to be an all-in-one carrying case, full-length zippers reveal a tactical internal design with a plethora of storage options. Hook-n-loop pockets provide secure storage for oil bottles and cleaning solutions while pocket flaps prevent accidental spills. Stay organized with sewn loops that allow for storage of multiple brushes and cleaning rods. High-quality, corrosion-resistant canvas prevents deterioration from harsh cleaning chemicals. 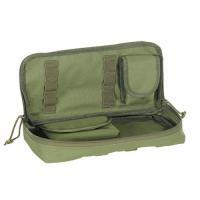 MOLLE compatible straps afford easy attachment to shooting mats, vests and packs for convenient portability. Outside pockets provide a visible panel for a unit or ID patch, so you don't have to worry about losing cleaning materials.